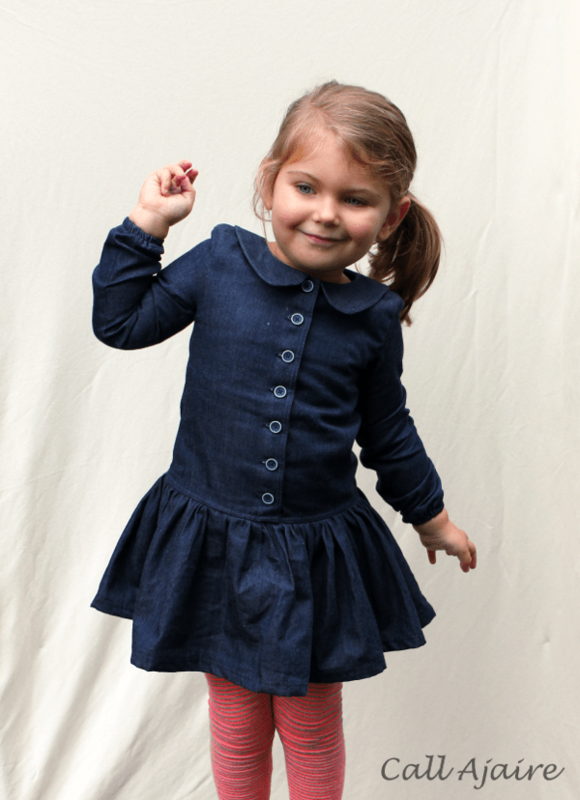 ModKid is having a sew-a-long for the Avery Dress this week, which is one I’ve been meaning to sew for a while. 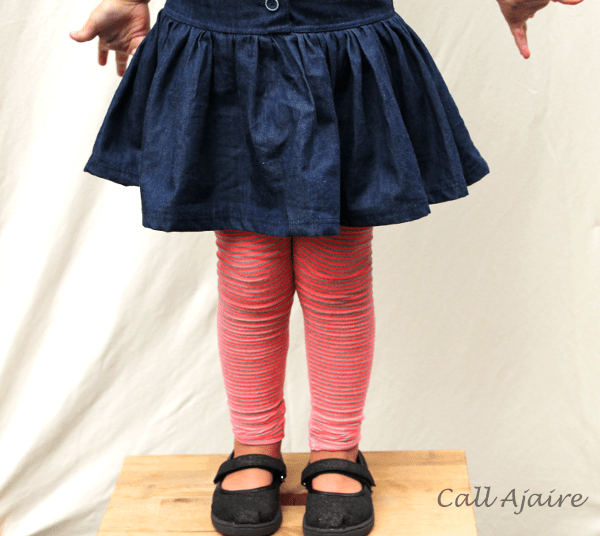 Since it’s the Denim Challenge week at Project Run & Play I decided to make a simple Avery in a dark denim that can be worn with fun leggings all winter. 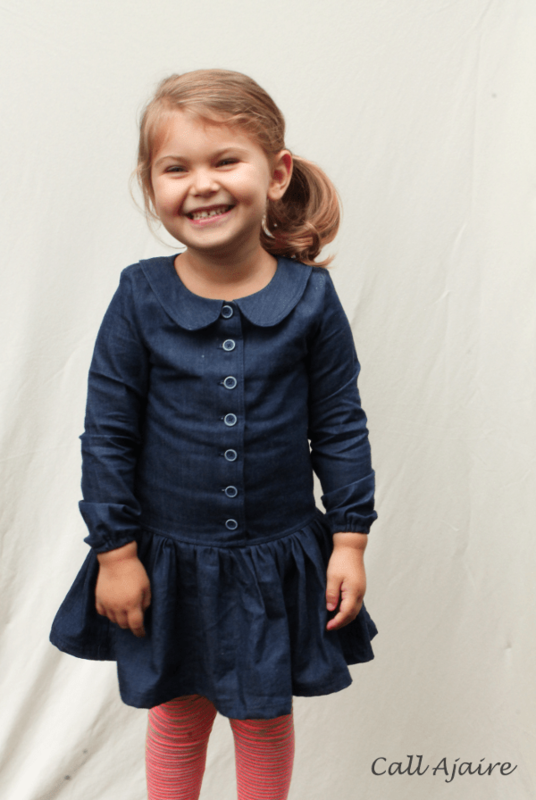 I picked up some denim with a bit of a stretch at JoAnn for myself and there was enough to make this sweet dress for Bean too. I really like the contrast collar Averys I’ve seen, but I stayed true to letting this be a solid color dress that can be worn with any cardi/leggings combo. I adore a drop waist (stay tuned for a fun signature look next week) and this dress has the perfect shape. In these pictures Bean had already been wearing the dress for hours so it’s wrinkly and worn and even has a bit of paint on it from the morning activities. But that’s the point right? It’s a cute dress that is comfy to wear so it’ll be worn, hehe. I really like the long sleeve with the elastic at the wrist. It’s bunched up a bit here, but again she’d been wearing it all day. For the buttons I decided to stay with the simple look and use some with navy centers and a white stripe along the edge. I think it’s just enough of a pop to make the dress more than just a jean dress. Sadly I think Bean’s most recent growth spurt (that’s two big ones in two months!) has her on the edge of 4t so this 3t dress may not fit her as long as I had hoped. It fits great right now so we’ll just use it as much as we can this fall and then I’ll get a chance to make another one in a bigger size. 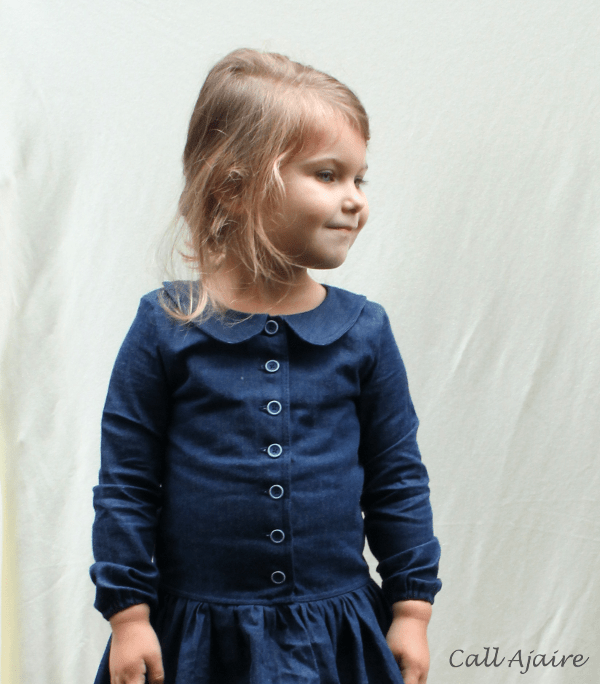 Are any of you sewing along with the Avery Dress? It's perfectly simple and adorable!! Darling. I love this silhouette on Bean. It is so sweet! Those darn growth spurts! Time to have another to inherit all of these awesome clothes?? LOL It's adorable Ajaire!!! I love it! Love this dress. It is one we don't have(hard to believe). We may have it soon. Gorgeous dress! If denim dresses were more like this, I would love them. And her eyes are just killer! I love this color denim!! What a perfect dress! I love everything about it; the peter pan collar, the gathered skirt, the drop waist. <3 And I hear ya on wrinkly photo shoots. I feel like just about all the pictures I take involve photo shop spot removing food stains/drool/dirt from them. Cute, cute, cute–I admire that you resisted the contrast collar temptation, because it will be a great backdrop for so many other prints this way! Thank you!! I think the pattern silhouette is just darling. Haha or I'll just send them to a friend…. The shape is super cute huh? Thanks Jaime! Have you sewn an Avery? You guys will love it Donna! It's such a sweet dress. It was so hard to resist, Beth! I really love the versions I've been seeing with the contrast collars and sleeves, but I wanted this one to be solid. Thanks!